Bees find their way into a new hive during a demonstration class taught by local beekeeper Jerry Owens. He taught first-time beekeepers how to transfer a new colony of bees into a hive. Jerry Owens teaches a class on how to transfer bees from a nook into a hive. Analyzing the health of the hive is important before transferring them, Owens said. He brought about two million bees into Rapid City to sell to local beekeepers. Some drove from Wyoming to pick up bees. Jerry Owens, left, talks with Mary Grassrope and Darrell Evenson as they pick up two nooks full of bees. They live outside of Rapid City and use bees to help pollinate their gardens. Grassrope said her yield increased three-fold after introducing bees into her garden. Bill Clements uses packing tape to secure bees escaping from a box before transporting them to a new hive. Clements is the president of the Wannabe Hobby Beekeepers in Rapid City. People put on their bee suits before Jerry Owens teaches them how to properly transfer bees into a new hive Saturday. Owens brought two million bees from Nebraska to beekeepers in Rapid City. Last year the South Dakota bee population dropped 40 percent. Honeycomb is seen inside of a bee colony during a beekeeping class taught by Jerry Owens. Andrew Snyder zips up his bee suit before transferring bees to a hive on his property off Tillford Road. This is his first year as a beekeeper. Andrew Snyder prepares the smoker before transferring bees into his new hive. This is his first year as a beekeeper. Ronda Snyder carries a jar of sugar water before they transfer the bees into her son's new hive. Snyder is also trying beekeeping for the first time this year. It might be a small contribution, but Jerry Owens was abuzz with excitement as the sun came up Saturday. Owens delivered about two million honeybees from Nebraska to dozens of beekeepers hoping to do their part to help the troubled bee population. Members of the Wannabee Hobby Beekeepers club picked up their new broods and many donned new beekeeper suits and stayed for a demonstration by Owens in the park next to Canyon Lake Senior Center on how to successfully move the bees from their delivery box into a new hive. The conversation quickly turned to their reasons for keeping bees. Many cited the drastic die-off of bees in recent years. "We just decided we kind of owed it to the environment," said Sue Hauff of Whitewood, who was embarking on her first attempt at beekeeping with her daughter Sierra, 12. "We have 80 acres with 1,200 grapevines and we just planted apple trees and plum trees, but all of that is secondary because we want to help the bee population." Every year the honey bee population gets a little smaller in the U.S. and most other countries. Since 2006, when drastic losses of 50 percent or more were reported, the U.S. Department of Agriculture has been tracking the mysterious phenomenon of disappearing colonies, referred to as Colony Collapse Disorder or CCD. Since the beginning of the study, the average loss of bees has hovered around 30 percent. And according to a report released by the USDA earlier this month, 31 percent of bee colonies died over the winter, totaling about 800,000 bees nationwide. Not only could South Dakota's title of the No. 2 honey producer in the U.S. be in jeopardy if the decline keeps up, but all of agriculture could suffer. According to the South Dakota Department of Agriculture data, the state is home to 163 commercial beekeepers, who maintain about 250,000 hives at approximately 6,800 locations across the state. 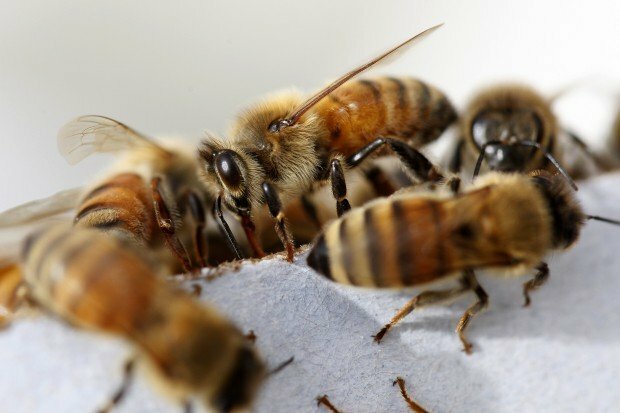 The bees don't just make honey and other products. They pollinate crops. Pollinators are responsible for billions of dollars in contributions to the U.S. economy. A 2005 USDA report found that pollinators contribute about $40 billion to the economy. Experts have still not determined what is causing CCD. Many think it's a combination of pesticides, diseases and human population growth. Entomologist Paul J. Johnson, a bee expert with the Insect Biodiversity Lab at South Dakota State University, said he believes a lack of bee-friendly crops can also be hurting the local population. 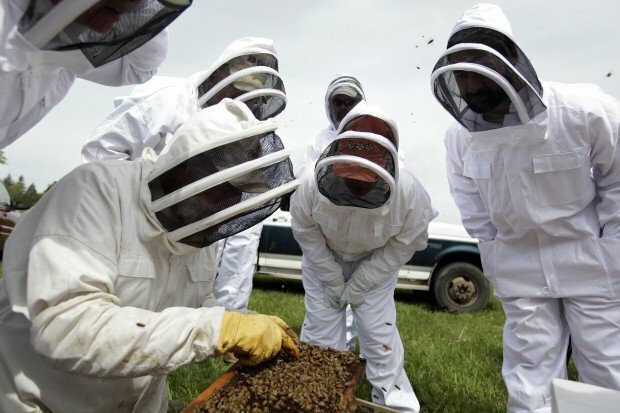 "With the current high rates of conversion of the last of the privately held wildlands, pastures, hay fields, alfalfa fields, and other lands that have provided the primary honeybee foraging areas, for the growing of corn and soybeans, the apiarists (beekeepers) will feel the pinch very soon," Johnson said. "Put simply, no flowers, no bees, period. Corn, soybeans, and wheat do not provide bee support. Also, highway departments, county weed control districts and other heavy herbicide users also contribute to the decline in bees due to the killing of bee-attractive flowering plants." But the irony is the declining U.S. bee population means more profit for some of the large South Dakota honey bee companies, Johnson said. And while making more money, the companies also risk hurting the national bee population even more. Some of the larger bee industry operations ship the bees off to farms in California, Texas, Florida and other southern states in the winter to help with pollination of their crops. "When these companies move these populations, it stresses the bees and it also spreads diseases and mites faster," Johnson said. He said the bees are moved around the country not only because South Dakota has to pick up the slack for declining populations, but the farmers increase their yield while making money for the bee renters here through rental and increased honey production. "Its strictly a profit situation. South Dakota ranks high in honey production simply because we have companies that have thousands of hives they move around the country," Johnson said. "Since the company is based in South Dakota even though the nectar might be from flowers from Utah or California, we still credit the honey with coming from South Dakota." As for trying to help the bees, not a lot is being done institutionally, according to the entomologist. "Nobody cares about bees if money is to be made from the land planted to corn," Johnson said. "This is a glaring example of the functional hypocrisy where subsidized agriculture puts money in the pockets of growers at the detriment of the environment, including honeybees and native bees." The primary private interest in bee protection is the Xerces Society, based in Portland, Ore., which leads mostly an education campaign about the losses of native bees, Johnson said. "I am unaware of any public or private effort to actually and substantially mitigate losses by correcting land use policies, herbicide or pesticide uses, or the promotion of natural and native plant communities explicitly for the purpose of protecting or enhancing bee populations," he said. But locally some optimistic hobbyists are hoping to help do their part in saving the honey bee. The Wannabee Hobby Beekeepers has steadily grown since the club's creation in 2009 and now boasts a 300-person email list with dozens of active members attending monthly meetings. Owens said the thing that makes him happiest is to see children taking an interest in beekeeping. "I am just so tickled that more young people are starting to get involved in bees," Owens said. "If young people don't continue to do it, it will die out. We need them to do the right thing for the bees and for the environment." Contact Jennifer Naylor Gesick at 394-8415 or jennifer.naylorgesick@rapidcityjournal.com. Two million bees were delivered to Rapid City for local beekeepers.